ThinkIN for Industry is a location intelligence solution built on top of Quuppa Intelligent Locating System™. ThinkIN’s platform has allowed NGK to digitize the shop floor by recreating the plant on screens accessible to all workers. Thanks to the data collected by tags and devices, workers can use the interface to find pallets around the manufacturing plant based on the information of the goods transported by the pallets, such as product type, bench number, kill cycle, and other key criteria for the production routing. The efficiency of the shop floor was significantly increased thanks to ThinkIN for Industry. 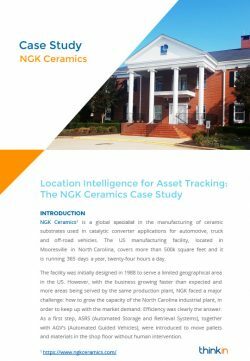 In the first year, NGK Ceramics reduced the costs of the wasted time searching for pallets and of the time spent doing the annual inventory. Thanks to the new solution, the inventory is constantly up-to-date. Moreover, the accuracy in tracking reduced the risk of accidents caused by the movement of pallets with forklifts in the shop floor searching for the needed pallet.